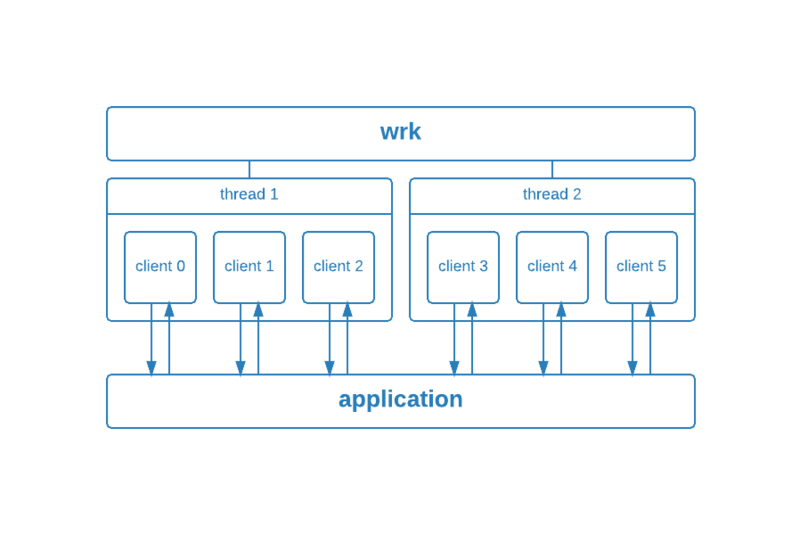 This article focuses on an open-source HTTP benchmarking tool called wrk, which measures the latency of your HTTP services at high loads. Latency refers to the time interval between the moment the request was made (by wrk) and the moment the response was received (from the service). This can be used to simulate the latency a visitor would experience on your site when visiting it using a browser or any other method that sends HTTP requests. Tests can't be compared to real users, but they should give you a good estimate of expected latency so you can better plan your infrastructure. Tests can also give you insight into your performance bottlenecks. wrk is open source and can be found on GitHub. As you can see we will use wrk in a very simple scenario. We will benchmark an Express on Node.js application. We will spin up two Droplets: one for wrk, which generates the load, and the other one for the application. If they were on the same box, they would compete for resources and our results wouldn't be reliable. The machine which benchmarks should be strong enough to handle the stressed system, but in our case the application is so simple that we will use machines of the same size. Smaller Droplets will work too, but you should expect more latency in the test results. In a real testing environment, your app server should be the same size you intend to use in production. If you need help setting up Droplets, please refer to this article. To make our lives easier we will use Docker, so we can start wrk and our application inside containers. That lets us skip setting up a Node.js evironment, npm modules, and deb packages; all we need is to download and run the appropriate container. The saved time will be invested in learning wrk. 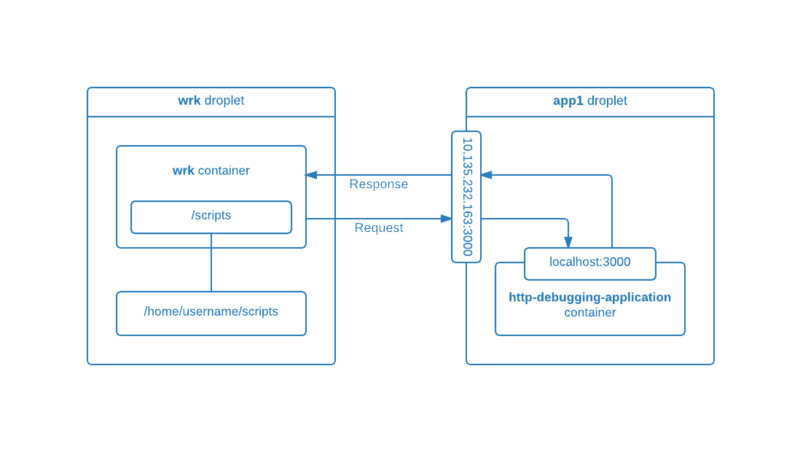 If you're not familiar with Docker, you can read an introduction to it here. Note: The commands in this section should be executed on both Droplets. If you are using a different Linux distribution, Docker has installation documentation that will probably cover your case. Execute these commands on the app1 Droplet. For testing purposes, the author published a Docker image in the public Docker registry. It contains a HTTP debugging application written in Node.js. It's not a performance beast (we won't break any records today) but it's enough for testing and debugging. You can check out the source code here. Of course, in a real-life scenario, you would want to test your own application. Your private IP address will be different, so please make a note of it. The command above will first download the required Docker image, and then run a Docker container. The container is started in detached mode which simply means that it will run in the background. 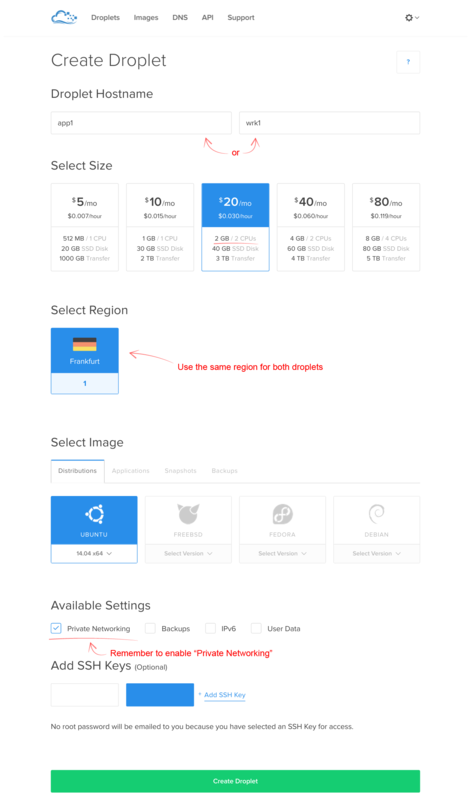 The option -p $APP1_PRIVATE_IP:3000:3000 will proxy all the traffic to and from the local container on port 3000, and to and from the host private IP on port 3000. The application is very simple and returns just an ok message. So each time wrk requests this application, it will get a small ok message back. The most important part is that we can see what requests are made by wrk to our application by analyzing the application logs. You can leave this running while you run your benchmark tests, if you'd like. Exit the tail with CTRL-C.
Log in to the wrk1 server and get ready to install wrk. The command above downloads a Docker image that contains wrk. We don't need to build wrk, nor install any additional packages. To run wrk (inside a container) we only need to start a container based on this image, which we'll do soon. The download should take just few seconds because the image is very small - less than 3 MB. If you would like to install wrk directly on your favourite Linux distribution visit this wiki page and follow the instructions. We'll also set the APP1_PRIVATE_IP variable on this server. We need the private IP address from the app1 Droplet. Remember to change the 10.135.232.163 IP address to your app1 Droplet's private IP. This variable will be saved in the current session only, so remember to re-set it the next time you log in to use wrk. In this section we will finally see wrk in action. All the commands in this section should be executed on the wrk1 Droplet. Now that we have a good overview, let's compose the command to run our test. Note that this command won't do anything yet, since we're not running it from inside the container. This can also be described as six users that request our home page repeatedly for five seconds. Wait a few seconds for the test to run, and look at the results, which we'll analyze in the next step. Here we can see a brief summary of our benchmark configuration. The benchmark took 5 seconds, the benchmarked machine IP is 10.135.232.163, and the test used two threads. This part shows us the normal distribution details for our benchmark - what parameters a Gaussian function would have. Benchmarks don't always have normal distributions, and that's why these results might be misleading. Therefore always look at the Max and +/- Stdev values. If those values are high, then you can expect that your distribution might have a heavy tail. Here we see that during the time of 5.01 seconds, wrk could do 5494 requests and transfer 1.05MB of data. Combined with simple math (total number of requrests/benchmark duration) we get the result of 1096.54 requests per second. Generally, the more clients you set, the fewer requests per second you should get. The latency will also grow. This is because the application will be under heavier load. Your goal is to keep the Requests/sec as high as possible and the Latency as low as possible. Ideally, the latency shouldn't be too high, at least for web pages. The limit for a page load time with assets is optimal when it's around two seconds or less. Server resources - is it a big or small instance? Type of your service - is it a cache which serves static files or an ad server which serves dynamic responses? Request and response type - is it a small AJAX request or a fat API call? For a more detailed discussion of application improvements, check out 5 Ways to Improve your Production Web Application Server Setup. Remember to benchmark your service after applying changes to it - only then can you be sure that your service has improved. That's it, you might think, if there wasn't this Lua thing . . .
Because wrk has a built-in LuaJIT (Just-In-Time Compiler for Lua) it can be extended with Lua scripts. As mentioned in the introduction, this adds a lot of functionality to wrk. Using a Lua script with wrk is simple. Just append the file path to the -s flag. Because we use wrk inside of Docker, we have to first share this file with the container. This can be achieved with Docker's -v option. We explained the wrk command and its options in an earlier step. This command doesn't add too much more; just the path to the script and some extra commands to tell Docker how to find it outside the container. The --rm flag will automatically remove the container after it has stopped. But do we actually know how to write a Lua script? Don't fear; you will learn it with ease. We'll go over a simple example here, and you can run your own more advanced scripts on your own. Additionally, the running phase can be split into three steps: init, request, and response. This function receives extra command line arguments for the script which must be separated from wrk arguments with --. Use the wrk.format helper function to shape the request object. Each thread has its own Lua context and in it its own local variables. Now we'll go through a few practical examples, but you can find many more useful benchmarking scripts in the wrk project's scripts directory. Let's start with the simplest example, where we simulate a POST request. Begin with creating a scripts/post.lua file on the wrk1 Droplet. This script is very simple and we didn't even use any of the mentioned methods yet. We just modified the global wrk object properties. We changed the request method to POST, added some login parameters, and specified the Content-Type header to the MIME type HTML forms use. The output is similar to the one we saw earlier. For a more realistic scenario you should increase the number of clients and threads, while simultaneously observing the latency parameter, to see how quickly the application can validate the user credentials. Another common need is to test multiple paths of an application simultaneously. Let's create a file called paths.txt in a data directory and add all the paths which we want to use during our benchmark. While this tutorial isn't trying to teach Lua scripting in detail, if you read the comments in the script, you can get a good idea of what it does. The multiple-url-paths.lua script opens the /data/paths.txt file and if this file contains paths, they are saved into a internal paths array. Then, with each request, the next path is taken. Now you might think that other benchmarking tools can do these types of test as well. However, wrk also has the ability to process advanced HTTP requests using JSON or YAML formatting. For example, you could load a JSON or YAML file which describes each request in detail. The author has published an advanced example with a JSON request on the author's tech blog. You can benchmark any kind of HTTP request you can think of, with wrk and Lua. After reading this article, you should be able to use wrk to benchmark your applications. 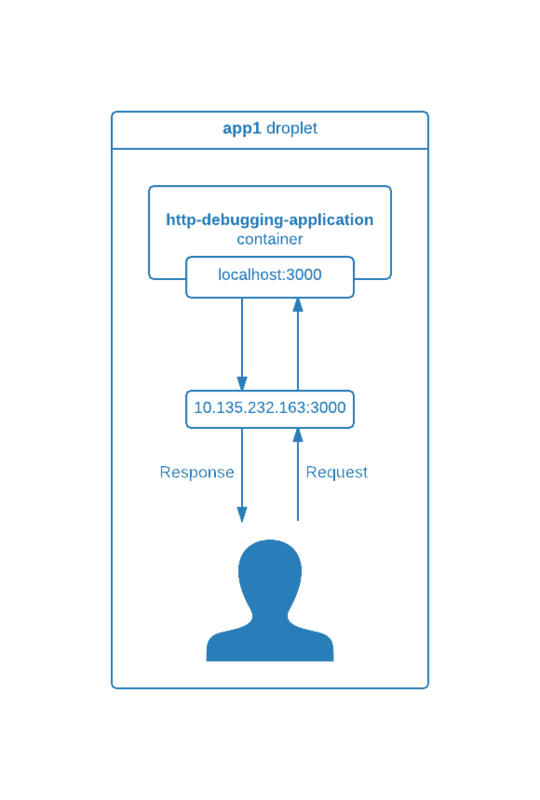 As a side note, you can also see the beauty of Docker and how it can greatly minimize setting up your application and testing environments. Finally, you can go the extra mile with advanced HTTP requests using Lua scripts with wrk.